How to reset oil service light Pontiac Pursuit. Turn the ignition to RUN/ON, with the engine off. Push the info and reset buttons on the DIC at the same time to enter the personalization menu. Push the info button to scroll through the available personalization menu modes until the DIC display shows OIL-LIFE RESET light. Push and hold the reset button until the DIC display shows ACKNOWLEDGED. This will tell you the system warning light has been reset. If the CHANGE OIL SOON indicator comes back on when you start your Pursuit, the engine oil life system has not reset. All information how to reset oil service light Pontiac Pursuit is taken owner’s manual. OIL LIFE Pontiac Pursuit. Press the information button until OIL LIFE is displayed. The engine oil life system shows an estimate of the oil’s remaining useful life. It will show 100% when the system is reset after an oil change. It will alert you to change your oil on a schedule consistent with your driving conditions. In addition to the engine oil life system monitoring the oil life, additional maintenance is recommended in the Maintenance Schedule in this manual. Always reset the engine oil life system after an oil change. See above how to reset oil service light Pontiac Pursuit. CHANGE OIL SOON Pontiac Pursuit. This message will display when the life of the engine oil has expired and it should be changed. 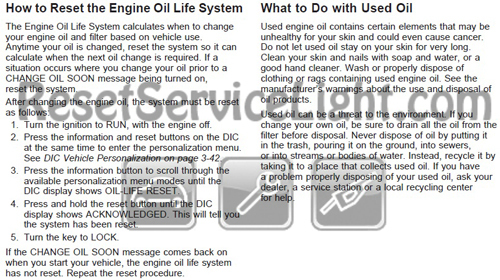 When you acknowledge the CHANGE OIL SOON message by clearing it from the display, you still must reset the engine oil life system separately. OIL-LIFE RESET Pontiac Pursuit. When this feature is displayed, you can reset the engine oil life system. 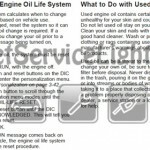 To reset the system, see above how can you reset oil service light Pontiac Pursuit. When to Change Engine Oil Pontiac Pursuit. Your vehicle has a computer system that lets you know when to change the engine oil and filter. This is based on engine revolutions and engine temperature, and not on mileage. Based on driving conditions, the mileage at which an oil change will be indicated can vary considerably. For the oil life system to work properly, you must reset the system every time the oil is changed. When the system has calculated that oil life has been diminished, it will indicate that an oil change is necessary. A CHANGE OIL SOON message in the Driver Information Center (DIC) will come on. Change your oil as soon as possible within the next 600 miles (1 000 km). It is possible that, if you are driving under the best conditions, the oil life system may not indicate that an oil change is necessary for over a year. However, your engine oil and filter must be changed at least once a year and at this time the system must be reset. It is also important to check your oil regularly and keep it at the proper level. If the system is ever reset accidentally, you must change your oil at 3,000 miles (5 000 km) since your last oil change. Remember to reset the oil life system whenever the oil is changed. That it is the full procedure how to reset oil service light Pontiac Pursuit. If you like to reset any maintenance oil light after an oil change. Or reset check engine light, airbag light, inspection key or insp errors when maint reqd, for Pontiac cars. Or any warning light for service reminder which appears on the display. Write in the search box the car name for which you want to find information, and find how to reset other service reminders by yourself.